Don't you love it when you find exactly what you need, when you need it! Great score! Thanks for visiting my blog and featuring one of my posts in your Food for Thought section! I hope you are enjoying your raised bed garden! Is it too early in the season to reap any fruits of your harvest? yes yes yes! i agree with this post! one of the things on our long term wish list is a small trailer for hauling. short term, we happily and successfully make do (which is why we haven't bought the trailer yet) with a yakima roof rack and my brother's truck on occasional loan! for those with just cars, a roof rack goes a lonnnnng way! Congratulations on your mention in Scholastic's Parenting magazine. :) I just saw it today, in last month's magazine. I'm envious! My "bush" beans are really POLE beans..?! I could use a pile of bamboo on the side of the road. Instead I think I'll check the Dollar Store...that's where I got my last pack of 12 green 1/2" poles...for a DOLLAR! 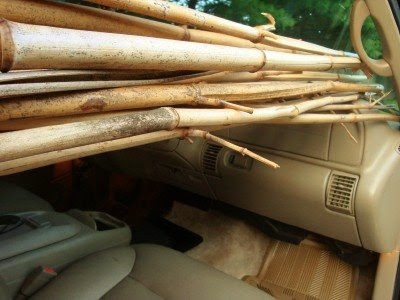 Bamboo stakes could be used for the "fort" too! awesome find! we used our apple tree prunings to stake our sugar snap peas. The regular snow peas are too heavy and need more support. I took one of the second row seats out of my mini-van since we only need all of the seats once a week. i love having the extra space for dumping the chair i trash picked two weeks ago, plus all the mulch that i hauled in may and june. awesome! we walked up the street just last evening to "harvest" some bamboo that a neighbor had cut and left for metro to pick up. i might need to go back for more, it is so light and easy to work with that now i have visions of fairy houses and trellises and all kinds of bamboo-y construction. Wow, just amazing. I know you were excited. Bamboo is so pretty too. How neat is that:)have a very Happy day..I know you will! Love the new wheels too! Such a good find, and a good point! I can point out around my house the treasures that have been shoved in our trusty blue station wagon! I think your greatest frugal asset is your ability to see the usefulness in something that others (ME!) would pass right by. Amazing! oh, yes, this could be MY car.... wouldn't you know? What a bountiful provision! I bought bush beans from Burpee that are turning out to be pole beans ... and all my pole are holding up tomatoes! Thankfully the water stained and faded green bamboo was on clearance at the hardware - for about $3 my beans will be happy! I wish I had a good hauling vehicle - so many times lately I've missed out on something good because I couldn't stuff it in the car! I am sorely missing our van, but at least the little car is cheap in gas!